Freshly Pressed and why it’s good for you and your WordPress blog! I was Freshly Pressed last week by the good people at WordPress and all I can say is WOW, what an experience! Not just content in offering one of the best blogging tools and content management systems around, WordPress has a wonderful feature called Freshly Pressed. Basically Freshly Pressed is a means by which WordPress promotes a handful of blogging sites on a daily basis through their home site (have a look here at http://wordpress.com/#!/fresh/). Freshly Pressed aims to bring to a wider audience some of the great content being produced and published in the blogosphere. The team at WordPress have a great write-up as to why you should care about being Freshly Pressed and how to be noticed by their editorial team – you can access their tips and hints here at So You Want To Be Freshly Pressed. To date there’s 425,657 bloggers on WordPress and 891,995 new posts being published daily, so there’s a lot of content to be read and reviewed by the editorial team at WordPress. However, if you are one of the lucky ones to be featured on Freshly Pressed you are going to find yourself being viewed by a whole new audience of bloggers who will engage, read and follow you. It brings a whole new meaning to the concept of content distribution and is an example of the importance of promoting your content. No matter how good you are, if your words are comparable in quality, wit and style to Shakespeare, Chaucer, or Sophie Kinsella, you’re only good if you are read. Get out there, be read, and gain an audience! My experience with Freshly Pressed was just remarkable. A hundred fellow bloggers liked the post, I had fifty insightful comments, and then there was the traffic. Put simply, it’s the blogging equivalent of Christmas Day. Thank you once again you lovely people at WordPress, and all of you bloggers who engaged with me. You really do make all of the time, effort, energy and research that I put into blogging worthwhile. 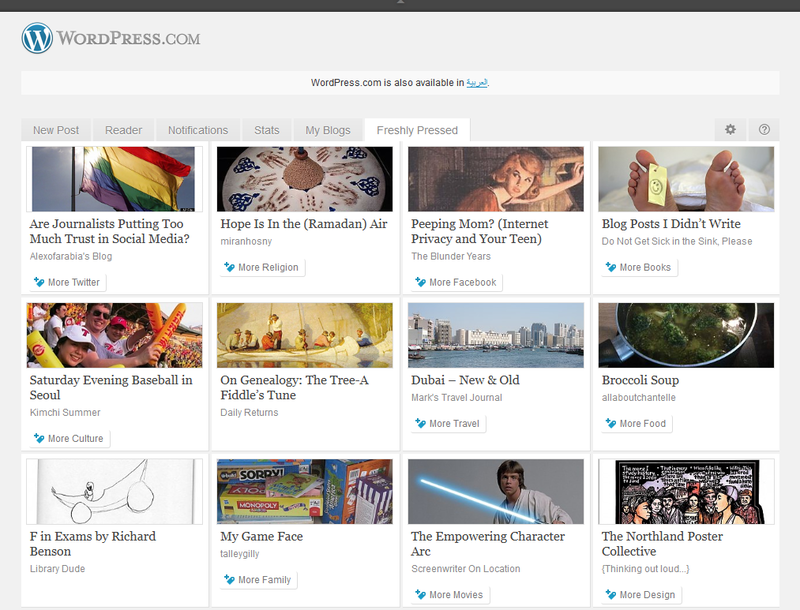 A screen shot capture of my blog on Freshly Pressed. Once you’ve gone Freshly Pressed blogging will never be the same! This entry was posted in Blogging and tagged content, content aggregation, content distribution, Freshly Pressed, wordpress by alexofarabia. Bookmark the permalink. Thank you Harsh. WordPress does have some great features, including its iPad app!